Spain has demanded an explanation from Venezuela over claims that it assisted two rebel groups which plotted to kill Colombia's President Alvaro Uribe. 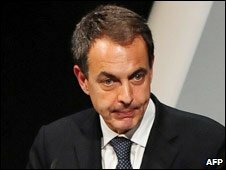 Spanish PM Jose Luis Rodriguez Zapatero said that Madrid would "act in accordance with that explanation". Earlier, a Spanish judge charged six suspected members of Basque separatist group Eta and seven alleged Colombian Farc rebels with various offences. He said he believed Farc had asked for Eta's help in a plot to kill Mr Uribe. The Venezuelan government has not publicly commented on allegations it was involved. In a 26-page indictment on Monday, Spanish judge Eloy Velasco said an investigation launched in 2008 had turned up evidence "that demonstrates Venezuelan governmental co-operation in the illicit collaboration between Farc and Eta". 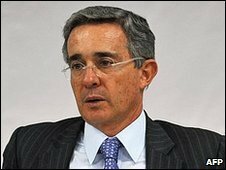 The judge added that he believed Farc had asked for Eta's help in a plot to kill Colombian officials in Spain, including Mr Uribe. He did not say when the attack was to be carried out. He said Eta and Farc had been collaborating since 1993, and accused Arturo Cubillas Fontan of being a key link. Mr Fontan lives in Venezuela and has held a job in the government of President Hugo Chavez - and may still have one - the judge wrote. He is also a key member of Eta, running its operations in Venezuela and the region, the indictment said. It said Mr Fontan "co-ordinated relations between Farc and Eta and the participation of Eta members in courses on explosives and urban guerrilla warfare". The judge charged Mr Fontan, along with two Farc members, Edgar Gustavo Navarro Morales and Victor Ramon Vargas Salazar, with conspiracy to commit terrorist murders. His investigation found that Farc members had travelled to Spain to try to kill former Colombian President Andres Pastrana and to stage an attack on the Colombian embassy. A Farc member reported that "it would not be difficult to carry out an attack on those two targets as long as they could count on the help of Eta", the indictment said. Later the target list was allegedly expanded to include Mr Uribe and other Colombian officials. The investigation was launched after links to Spain came to light when a computer used by Farc leader Raul Reyes was seized during a Colombian military raid on a Farc camp in Ecuador in March 2008. Both Eta and Farc claim to be rooted in left-wing ideology. Eta has been blamed for more than 820 deaths during its 41-year campaign for an independent Basque homeland in northern Spain. Farc has been fighting even longer, mounting a major insurgency intended to topple the Colombian government and establish a Marxist-style state. There have long been allegations of links between Farc and President Chavez's left-wing government in Venezuela. In 2008 a major diplomatic dispute arose after Colombia accused Venezuela of running arms to Farc. Mr Chavez has strenuously denied any such links. The allegation is part of the indictment in which six Eta and seven Farc members were charged with a variety of crimes, including including terrorism and conspiracy to commit murder. Both Eta and Farc are listed as terrorist organisations by the US and EU.